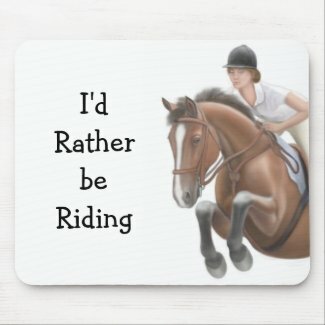 Order Cute, Funny, and Personalized Horse and Equestrian-themed mouse pads in a variety of styles. 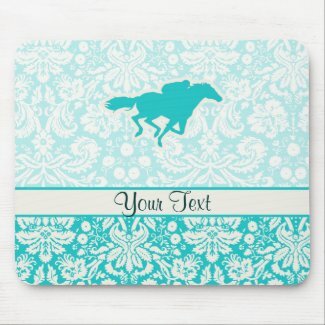 You will love this cute teal damask horse racing equestrian race horses jockey design. Great for gifts! Customize with any name! 9.25" x 7.75" – Perfect for any desk or work space. Quality, full-color printing. Durable cloth cover is dust and stain resistant. Non-slip backing. 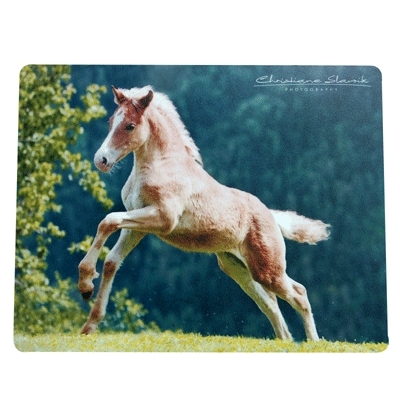 Our wonderfully colorful Appaloosa Horse mousepad adds an artistic flair to your home or office. 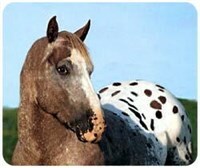 Dazzle coworkers and friends with the delightful face of the Appaloosa Horse and add function to your work space. 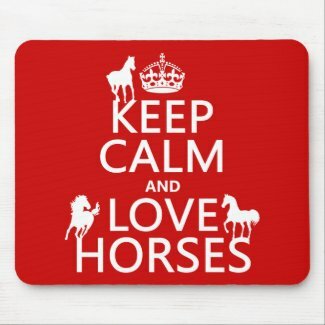 Horse enthusiasts will rejoice when they see this amazing mouse pad! 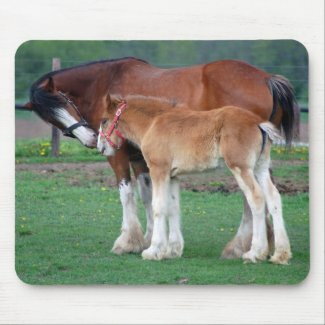 Our Appaloosa Horse mousepads are made of durable polyester fabric with a no-slip rubber base. Your office will never be the same when you snazz it up with this Appaloosa Horse mouse pad. The creative rendition of this Appaloosa Horse is the perfect way to add art to your office. Beautiful equine decor is yours with the Arabian Horse mouse pad. With a breathtaking mare and colt running through a verdant forest, this themed Arabian mousepad is a great addition to any Horse lover's collection. 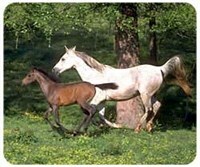 The legendary Arabian Horse is hereto keep you company as you surf the net or perform e-tasks. With its rubber base and smooth polyester surface, you'll love using your mouse on the Arabian Horse mouse pad. 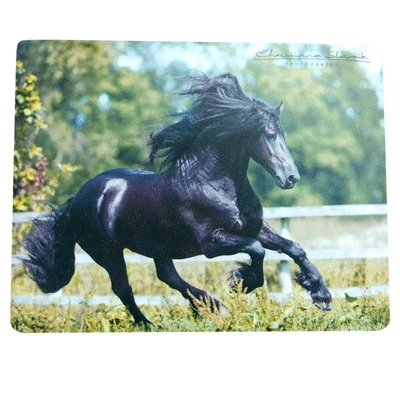 Our Arabian Horse mousepads are a luxurious 8.75 x 7.50 inches. Add beauty and grace to any desktop with our charming Gray horse mousepad. Featuring rounded corners and a durable polyester fabric surface for optimal traction, our Gray horse mousepad is perfect for your home or office. A no-slip rubber base provides stability on this eye-catching mouse pad, which also makes a thoughtful gift for anyone with an affinity for these gorgeous creatures. 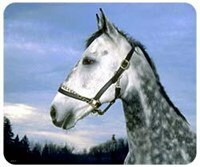 Those who pass by your desk will stop to admire the stunning picture featured on our Gray Dapple horse mouse pads. Original fine art design of a horse and rider by designer Carolyn McFann. 9.25" x 7.75" – Perfect for any desk or work space. 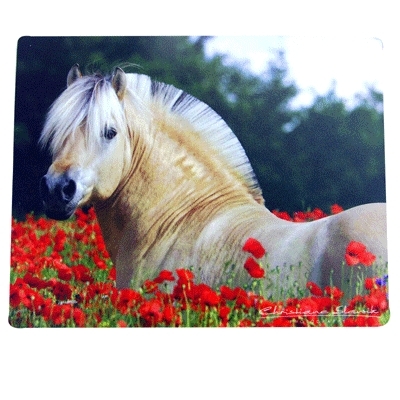 If you fancy yourself a horse enthusiast, you simply must have this gorgeous Paint Horse Mousepad. Depicting two stunning examples of the beautiful breed, this Paint Horse Mousepad will be a big hit at the office. Even non-horse lovers will ooh and ahhh over this bright and colorful mouse pad. Our Paint Horse Mousepads are topped with soft polyester for good mouse traction, and backed with a no-skid material that will prevent it from sliding all over your desk top. Decorate your desk with this design that looks great and protects your mouse from scratches and debris. Up-close photo of two beautiful horses. 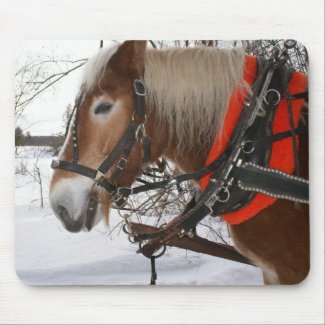 9.25" x 7.75"
With our Palomino Horse mousepad, you get so much more than great traction for your clicker or a non stick rubber base. You get a beautiful bit of the stables to keep you company while you work or play indoors. 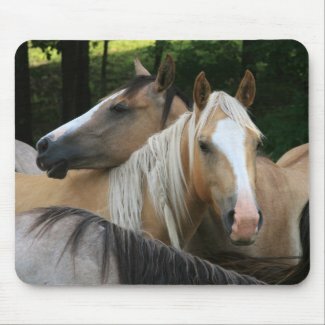 Emblazed with a gorgeous head shot of the magnificent Palomino, our mousepad reminds you of your special bond with one of nature's most regal creatures. 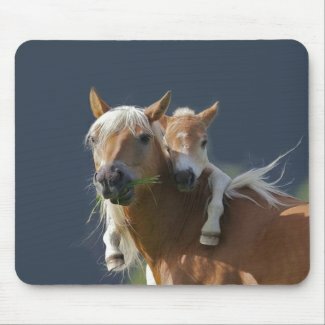 A mouse pad should always make your work space a little more personal, and our Palomino Horse mousepads definitely deliver. 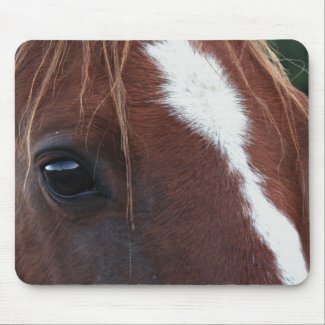 You'll love 100% of this attractive Quarter Horse Mousepad. 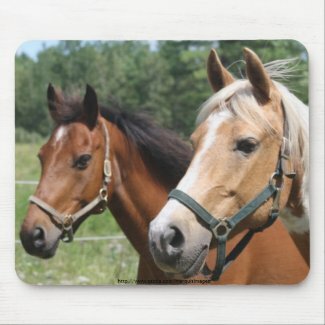 For equestrians and general animal enthusiasts alike, this Quarterhorse Mousepad is a great way to personalize your desk at home or at work. If you spend much time at your computer, you'll love the chance to glance down at your Quarter Horse Mousepads and remember your favorite breed of horses often. This Mouse Pad is as functional as it is beautiful. It features a no skid base and smooth polyester top for excellent mouse traction. 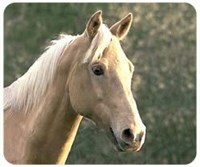 Classic image of a palomino and his kitty friend. silhouette horses standing on the words. This design makes a great present for riders and horse enthusiasts. Click the "Customize It" button for your choice of 20 different background colors to match your home or office decor. 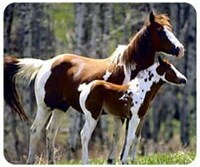 Mother horse and cute pony. 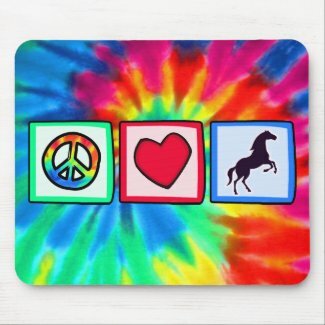 You will love this groovy tie dye peace, love, horse horses equestrian stallion colt design. Great for gifts! Available on tee shirts, smart phone cases, mousepads, keychains, posters, cards, electronic covers, computer laptop / notebook sleeves, caps, mugs, and more! Visit our site for a custom gift case for Samsung Galaxy S3, iphone 5, HTC vivid / Raider 4 G, Kindle Fire, Droid RAZR, or iPad & iPad mini! Also personalized invitaions, greeting & business cards, t shirts etc. at dogsandhorses Gift Shop. Closeup photo of a horse's face and soulful eyes. 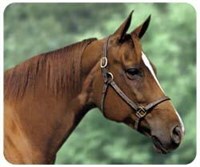 The horse is chestnut colored with white markings and its mane is in its big brown eyes. 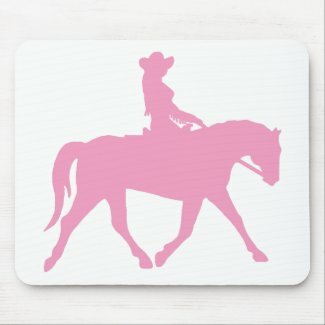 Cowgirl Riding Her Horse (pink) t-shirts, shirts, apparel & gifts feature a silhouette image of a cowgirl riding her horse. Great graphic for cowgirls, and the cowboys who love them! This design is available on fun gifts items and stickers, magnets, note cards, tote bags, hats, mugs, travel mugs and more at PetWorld Gifts Store. This is the pink version, also available in white and black. Closeup of team of beautiful Morgan horses in winter with wagon harness. 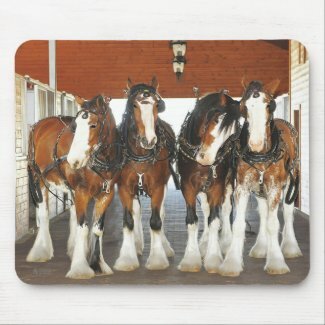 MANY MORE like this at Horse Mousepads at Zazzle.